Homey Mexican soups, nacho cheese, and a taste of SoCal at Oscar's Grill. The California burrito oozed with spicy housemade nacho cheese. Hours: Mon.–Fri. 10 a.m.–3 p.m. The first and last thing you need to know about Oscar's Grill, an otherwise generic-seeming Mexican-American cafe in Alameda, is that it's one of a small handful of places in the Bay Area where you can get the SoCal-style gut-bomb extraordinaire known as a California burrito. 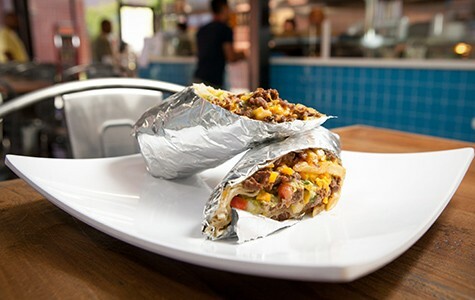 For the uninitiated, a California burrito, in its basic form, is stuffed with carne asada, guacamole, pico de gallo, cheese, and — most crucially — French fries that are wrapped inside of the flour tortilla, taking the place of the rice and beans that occupy half the real estate in the typical Bay Area burrito. Call it Mexicanized steak frites, served in a convenient, hand-held vessel. California burritos are a specialty of the San Diego area, where they are ubiquitous. In the East Bay, however, they're awfully hard to find — more common than a unicorn sighting, perhaps, but quite a bit rarer than any number of obscure regional specialties that require ingredients that are more exotic than the common French fry. Belly, an Uptown Oakland fusion spot with SoCal roots, offers a couple of different fry-stuffed burritos. In the Fruitvale district, The Half Orange — whose proprietor is a San Diego transplant — recently started serving a quesadilla-burrito hybrid that has fries inside as an optional add-on. And that's about it. As a sometime burrito eater who believes — controversially, in this land of Mission-style burritos — that rice and beans are useless filler in a burrito, I'm willing to travel a great distance for a proper fry-filled version. Even if that meant making a trek to a fairly remote corner of Alameda. Make no mistake: You aren't coming to Oscar's Grill for the ambience. The place is tucked inside an office park whose predominant (and decidedly uninviting) design feature is tinted glass, on a road lined with similarly bland office parks. It's the kind of place you might visit for an annual dentist's appointment and stay the hell away for the other 364 days of the year. The cafe is owned by brothers Oscar and Rudy Granados, who also run a more traditional Mexican restaurant in Alameda called El Caballo Wraps. Penumbra, the medical equipment company that anchors the aforementioned business park, had hired El Caballo for several catering gigs in the past and eventually asked the Granados brothers to take over the company's onsite cafe. The restaurant is open to the public, but if it has a bit of an office cafeteria vibe — well, that's because that's essentially what it is. The homey green chicken enchilada soup was a pleasant surprise. Still, if you're in the vicinity of, say, the Coliseum or Oakland International Airport, the California burrito alone makes it a worthwhile lunch destination — especially given the dearth of dining options nearby. Indeed, given the setting, this was a better burrito than I had any realistic reason to expect. The beef wasn't as tender as it is in the Asian-inflected version at Belly, and the French fries weren't as quite as crisp. But the combination of flavors and textures was outstanding: the chewy savoriness of the grilled steak, the cool tanginess of the guacamole, and the modest crunch of the thin-cut fries. Best of all, the version at Oscar's was loaded with a spicy housemade nacho cheese that oozed richness into every bite. Where diners might run into trouble is if they go to Oscar's expecting it to be a regular taqueria. The taco prices alone were enough to give me pause: $4.25–$4.50 for a single taco? Granted, the fish taco featured a generous portion of (very fishy-tasting) grilled tilapia, but the other ingredients never quite came together: shredded lettuce, refried beans, guacamole, and a reddish-orange chipotle aioli all just muddled together. It wasn't so much a well-constructed fish taco as it was a generic taco where they happened to sub in fish for whatever meat might have gone into it otherwise. The shrimp taco was made of similar stuff, but tasted better — the sautéed shrimp was perfectly cooked. For office workers heading back to their cubicles after lunch, a carb-laden burrito might not be the wisest choice, so it's no surprise that Oscar's also features a decent selection of salads and soups. For a restaurant with several prominent offerings that might broadly be categorized as stoner food, the most pleasant surprise was how good — and how homey — those soups were. A tortilla soup featured a hearty tomato-based chicken broth that was loaded with tender shreds of chicken and big chunks of soft-cooked vegetables, and offered the textural pleasure of alternately soggy and crispy strips of fried tortilla. 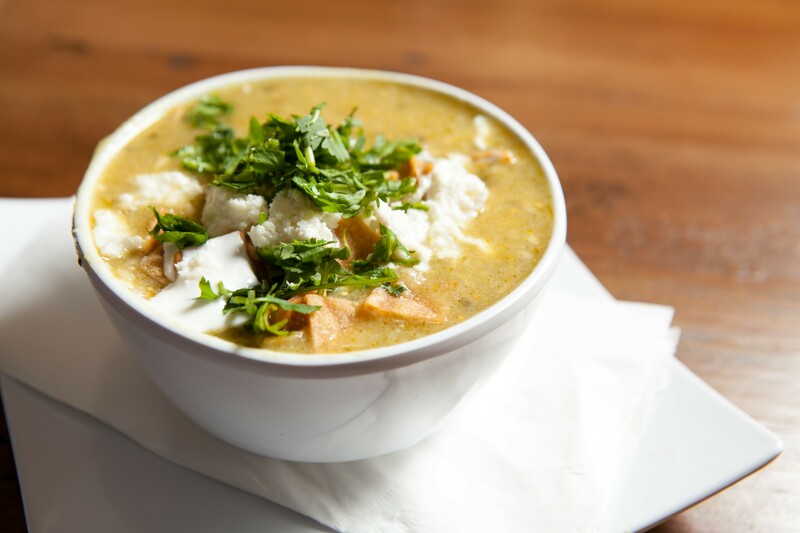 The tomatillo-based chicken enchilada soup — named after the green sauce that accompanies Mexico City-style enchiladas — was spicy and tangy-bright, like some Mexican-American analogue to Chinese hot and sour soup. A dab of sour cream and a bit of queso fresco on top added a layer of richness. And while I wouldn't make a special trip for them, it's worth noting that the pastries and cookies at Oscar's are made in-house, and that all the sandwiches are served on bread that's baked fresh daily. The Veggie Me-Lite sandwich didn't look like much — green on top of green on top of green (avocado, grilled zucchini, and cucumbers, with lettuce and tomato for good measure). Only a slather of basil aioli kept it from being wholly puritanical. It was basically a salad in sandwich form, but for the office lunch crowd, there's some demand for that kind of thing. Mostly, though, Oscar's is best if what you crave is large portions of Mexican-American comfort food made with more than the usual amount of care. For an office park cafeteria, that's not a bad thing at all.